For those who attended Design Days Dubai this year, you may have noticed some familiar artistic styles around Dubai Mall of late. A match made in heaven Fashion and Art have always had a close relationship. Collaborations and commissions between designers and artists have paved the way for window displays, fashion shows and even new collections for accessories and clothing. It's become an International way of business and we're glad to see it happening more and more in the UAE. 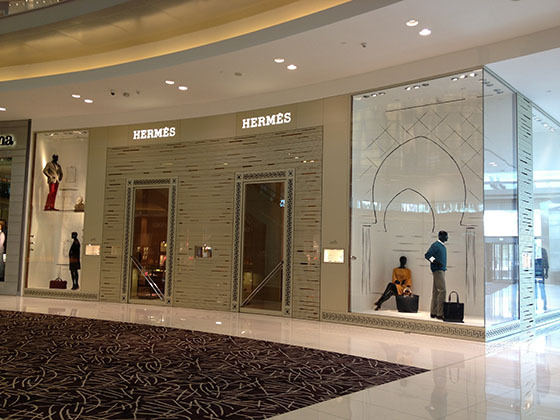 As you enter fashion avenue in Dubai Mall you can view a window display at Hermès by Analogia, a collaborative project between designer Andrea Mancuso and architect Emilia Serra. Using their distinctive style, a narrative titled 'A Love Story' is sketched in the air with black wool on a transparent web of threads. The display acts as a storyboard and takes you through the characters day - starting at their hotel room, then on an excursion at a mosque, and then finally a bar for drinks. The Hermès window display is only on view until 11th May 2013, however across the way in Level Shoe District a permanent installation by United Visual Artists now hangs above the Vogue Cafe. Titled 'Fragment' the artwork examines how light can fragment our vision by capturing, refracting and reflecting natural light. 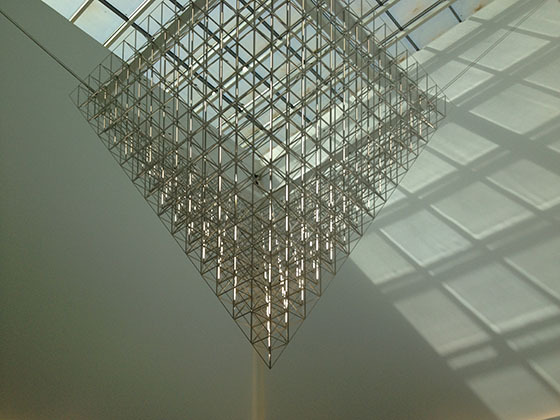 The sun’s rays will be used to create shifting light paintings from the sculptural object on the surrounding walls of the space.